The only thing that could possibly be more fun than competing in the International Rolex Regatta, scheduled for March 26-28, is watching it from shore. 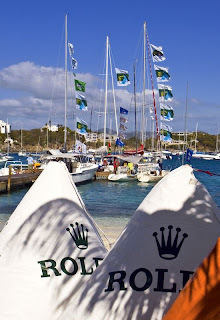 Among the highlights of the regatta's three racing days are Friday's "town races," which take the fleet from St. Thomas Yacht Club right into the heart of the bustling commercial harbour of Charlotte Amalie. The tradition now is for workers downtown to time their lunch breaks to coincide with the noon finish, while others host regatta parties for viewing from various vantage points along the course, which reverses itself when the fleet is started in the harbor after lunch and sent back home to the East End of the island. On Saturday, the IC 24 class will play part in another spectacle when they race off the beachfront at the Ritz Hotel, giving sun seekers there plenty to talk about. The IC 24s are innovative one-design boats that are indigenous to the islands and wildly popular. With a good breeze, they are physically challenging, and spectators don't get bogged down in guessing who wins - it's whichever team finishes first, no handicap rules to worry about here. The handicap racing classes (for CSA Spinnaker Racing, Spinnaker Racing/Cruising and Non-Spinnaker Racing) will, however, on the same day have their own chance to impress when they thread their way through and around the cuts, cays and islands off the east end of St. Thomas and along the picturesque coast of St. John. For Sunday, the beautiful and yet tactically demanding Pillsbury Sound Race, in and among the cays of St. Thomas and St. John, is a highlight of the regatta that finishes off the on-water excitement before racers enjoy the Sunday evening Rolex Awards Ceremony, where a giant stage magically appears in the shallow beach water at the St. Thomas Yacht Club and Rolex timepieces are presented to winners of select classes. Throughout the event, crews are well looked after with music, meals and dancing at the club and even a giant reggae music concert and food festival at Yacht Haven Grande, the luxury marina where some of the event's larger boats are berthed.